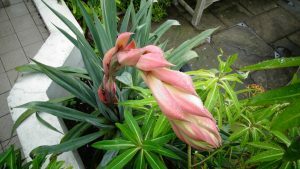 Beschorneria yuccoides in the family Asparagaceae, can be found on the Loudon Terrace. This striking evergreen perennial forms a very architectural focus of any planting scheme. Its long, strap like, succulent leaves are grey green in colour and covered in a white bloom (glaucous). Beschornerias become even more striking when they decide to flower. This can take a few years as it needs time to reach a critical size to have the energy to throw up its magnificent flower spike. The spike can vary in colour from pale pink to bright red, with yellow tubular flowers opening along its length in arching racemes up to four feet tall. Beschornerias are not fully hardy in England, as they originate in Mexico, so at the Birmingham Botanical Gardens it is grown in one of the most sheltered beds on the Loudon Terrace where it can receive as much sun light as possible and enjoy the protection of the walls and the glasshouses. It prefers a humus rich soil to grow in, which must have excellent drainage to help keep its root dry through the winter. Propagation is mostly from offsets produced at the base of the plant. These should be carefully removed in spring and replant in free draining compost until they are large enough to plant outside. They are usually pest and disease free, but they may suffer from scale insects, which can be squashed between your fingers when found. The only pruning generally needed is the removal of the spent flower spike.